Prestige & Classic Wedding Cars boast a luxurious range of classic and modern wedding cars for your big day in Leicestershire, filling it with glamour and style. We tailor everything to your every want and need, providing you with a fitting chauffeur and even have the vehicle driven to suit your requirements. All of our immaculate cars are available to hire throughout the Leicestershire and surrounding areas – including surrounding towns and villages such as Stamford, Melton Mobray, Oakham and Uppingham. We provide a professional and flexible wedding car service to relieve some of the stress from organising wedding. 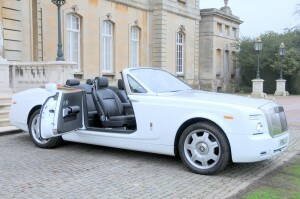 If you’re looking to upscale, extravagant and fancy the classic, handmade British Convertible Rolls-Royce Phantom Drophead Coupé may be for you. Available in white, leather interiors and 4 seats. However, if you’d much rather prefer a timeless classic, Beauford Tourer II is a beautiful and popular choice. In addition to weddings, Prestige & Classic also cater to parties and prom nights. Therefore, if you’re a parent looking for competitive prices and Hummers or pink limos then look no further than Prestige & Classic. Our entire fleet of wedding and prom cars are always driven by polite and suited chauffeurs who will go above and beyond to cater to your every need and ensure you have the best day/night. Whatever it is that you’re looking for, you’ll be sure to find with us. If your location is not listed above, then please do not hesitate to contact us for a personalised quote. You can get in touch by calling us on 01733 348122, emailing enquire@prestigeandclassicweddingcars.co.uk or by using the online booking form located here. We are pleased to offer an exceptional wedding car hire service from Peterborough providing a first class service across Cambridgeshire, South Lincolnshire, Rutland, West Norfolk, North Northamptonshire. Our fleet of immaculately presented wedding cars include many classic names such as Rolls Royce, Jaguar & Daimler, Studebaker & Beauford. On your special day simply relax and travel in style and luxury whilst being chauffeur driven in one of our stunning prestige, classic or vintage wedding cars. Book online now or call us on 01733 348122 to discuss your requirements or contact us here.